SIZE - 10.1/2" x 13.1/2"
This is a 1967 Armour Franks Advertisement with a Mickey Mantle Rawlings triple crown glove offer appearing Life Magazine. Fill out the form below, send in $5.00, a Label from Armour Star Franks, and receive a Rawlings Mickey Mantle Triple Crown Glove. Did you know? Why just one Armour Star Frank gave Mickey Mantle the food energy for 6 Home Runs! Using an Advertisement like this is a great way of dating your baseball memorabilia. 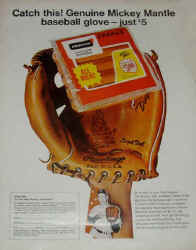 This wall mountable acrylic case holds one regular sized baseball glove. This custom display case comes with your choice of any of the MLB team logos or the standard MLB logo. You may elect to have the case with no logo as well. Please specify player or team name for your FREE engraved nameplate in the nameplate text box. All of our cases have a 50% U/V protection.